These generally can be avoided by being patient and attentive to your cats needs. Offering lots of spaces for your cat to sleep, eat and go to the toilet in peace, as well as providing safe hiding places will maintain your cat’s sense of control over their world. Cats area very territorial and need to be introduced to other animals very slowly in order to give them time to get used to each other. These slow introductions can prevent problems and conflicts from developing. The incoming cat will rarely be a problem as it is going into strange territory, it is usually the resident cat who may display initial hostility to the newcomer. At first, the new cat should be confined to one room, ideally a little-used room such as a spare bedroom, along with a litter tray, food and water bowls, a bed, scratching post, hiding places and of course toys. The new cat should be left to explore the room on her own, as it will become her comfort zone for the next few days, in some cases longer. A cats anxiety level is largely controlled by the confidence they have in maintaining control of their territory, so a cat will be less stressed if they are left alone at first, and also if they only have to cope with a small environment to begin with. Once the new cat is relaxed enough to start eating and toileting normally, then the next step is to start feeding your resident cats and the newcomer on opposite sides of the door to this room. This will help them both to associate something enjoyable (eating!) with each other’s smells. Gradually move the bowls closer to the door until the pets can eat calmly on either side of the door. Another good trick is to tie a toy, such as a catnip mouse, to each end of a shoelace or piece of string, and thread it under the door. In this way the cats can begin to play ‘with’ each other, without actually coming face-to-face. Switch sleeping blankets between the resident cats and the newcomer, or even rub a soft towel on the new cat (without upsetting him) and then place it somewhere in the room where the other cats can sniff it. Once the new cat feels relaxed and at home, allow him to explore the rest of the house while at the same time allowing the other pets to visit the new cat’s room, still keeping the door to the bonding room closed at this stage. To a cat, scent is more important than sight in the first few days. This switch allows the cats to experience each other’s scents without a face-to-face meeting. It also allows the new cat to become familiar with his new surroundings without being frightened by the other pets. Be aware that if either pet has a medical condition or is injured, then this could delay the introduction process since cats will pick up different scents. The final step should be for the new cat to meet the resident cat(s). This introduction should ideally happen during mealtime. All cats should be fed at the same time but their feeding areas should be in opposite ends of the room. Some growling and hissing should be expected at this point – this is quite normal as they figure out the new pecking order. If either cat seems upset or if a conflict looks likely, they should be separated immediately. Try another introduction when they are both calm. After the cats have finished eating they should be separated straight away. It’s better to introduce the pets to each other gradually so that neither animal becomes afraid or aggressive, although mild forms of these behaviours are to be expected. If either animal becomes fearful or aggressive, separate them, and start over with the introduction process in more gradual steps as before. Try to prevent conflicts: In some cases establishing a hierarchy among cats can be problematic. If any aggression develops between the cats, and their environment does not allow them to give way or hide from each other in tense situations, it can become quite uncomfortable for everyone in the household. The aggressive behaviour can become a learned one which the cat will use again and again if she is not stopped from exhibiting it. It is important that you try and stay one step ahead of the cats, and prevent any fighting from even starting by reading their body language. Try to distract them with a loud noise, even a hissing sound similar to a cat’s, or by throwing a toy in the opposite direction. If necessary, separate the cats until they have calmed down. One way of preventing aggressive behaviour is to make sure that all cats have their own private space to sleep, hide or rest, and that they do not have reasons to fight such as sharing food, litter trays or toys. It is also important that they are distracted so they do not resort to fighting with each other. Having enough stimulation such as sufficient play time, both with toys that they can play with on their own and with you, as well as hidden toys and treats will keep them busy and not give them much opportunity to show aggressive behaviour with each other. Reward your cats when they interact in a positive way. Never give a cat ordinary milk – it will make the cat ill as cats are Lactose intolerant, and cows milk contains a high amount of Lactose. You can purchase special Cat Milk from shops, these are low in Lactose and suitable for cats. Vaccinations and regular boosters reduce the chances of your cat catching a feline disease some of which can be fatal. Kittens are vaccinated at 9 weeks old, with the second dose given at 12 weeks old. Afterwards, the cat needs a single yearly booster. Vaccinations help protect against enteritis, cat flu, and leukaemia. Feline infectious enteritis – This is a severe and often fatal gut infection, which is caused by a virus that is widespread in the environment. Cat Flu – These viruses are very common and exist in many different forms. Leukaemia – A serious disease which is passed by contact from other cats such as bites. 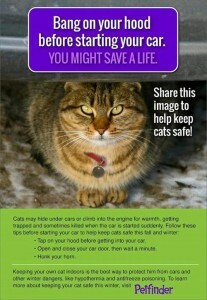 This is essential for outdoor cats. There are a number of parasitic worms that cats can suffer from. Treatments from pet shops are often not strong enough to eliminate all worm parasites, and veterinary centres sell various suitable treatments. Most cats refuse to take tablets, but there are powered granules that can be mixed into the cats food. Panacur are veterinary strength granules for cats and kittens that can control roundworm and tapeworm, and also treat lungworm. Worming treatment should be given 2 to 4 times a year, especially if your cat goes outside. Fleas can be a common problems especially for outside cats particularly during the summer months. Flea collars from pet shops are not recommended, as they are not strong enough to kill all fleas or other parasites. Important – Do not use cheap flea collars especially ones from pound shops. We have heard some cats have died due to an allergic reaction to cheap flea collars. Also, collars have the risk of getting caught in trees or fencing, and flea collars cannot break free like standard safety collars. Some stronger treatments can cover a wider range of parasites, such as Stronghold or Advocate. However, these can only be bought from a veterinary centre after a check-up of your cat. • Always dispose of antifreeze and water coolant safely and responsibly. Contact your local authority for advice; see www.direct.gov.uk and ‘search for your local council in England’ on the home page. 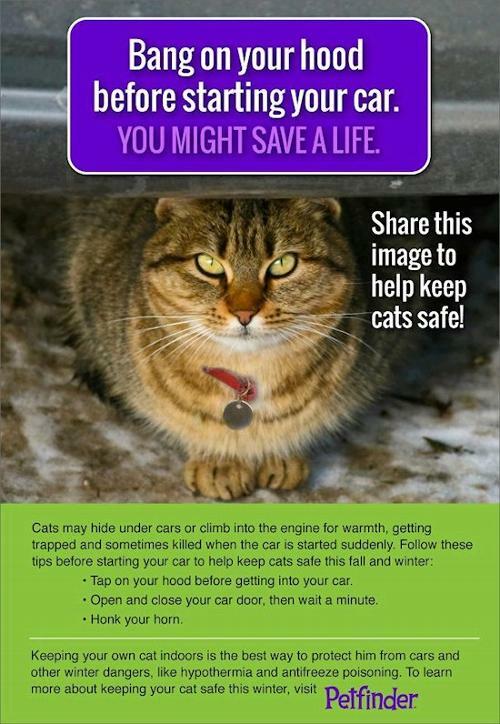 Antifreeze poisoning can cause pain, suffering, distress and ultimately, death. Poisoning cats can constitute a criminal offence; under the Animal Welfare Act 2006 the maximum penalty for anyone found guilty is up to 6 months imprisonment and/or a £20,000 fine.